Vocational and trade schools in New Mexico serve the state’s secondary and post-secondary students alike. High school, college and workforce readiness programs help students meet New Mexico’s employment needs. A vocational and trade education can prepare students for careers in the state’s fastest growing industries, like healthcare services and education, and New Mexico even has career and technical education options for distance learners. Read on to learn more about different career opportunities and vocational and trade schools in New Mexico. 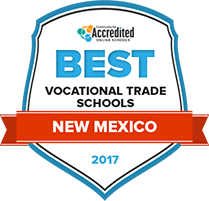 These rankings serve as an outline of the trade and vocational learning options available in New Mexico. The types of New Mexico schools offering vocational programs include community and career colleges, as well as trade schools, which often have students studying in various healthcare related fields. Rest assured our rankings include points that matter most, such as tuition, length of programs and financial aid options. San Juan College was founded in 1956. The school was formerly named Farmington Branch of the New Mexico College of Agriculture and Mechanical Arts. Freshmen, dual credit and transfer students are accepted. Degree and certificate career programs are offered. Occupational safety, health information technology, nursing, medical laboratory technology and fire science are among the degree programs. Many of the career degrees are administered through the School of Trades and Technology. Classes sizes are small. There are no minimum SAT or ACT admission scores. The college also does not have application deadlines. Subjects that two-year vocational degrees are offered in at Central New Mexico Community College are applied technologies, communication, humanities, sciences, engineering and healthcare. Working adults can pull up course schedules online via myCNM and campus email. Additional student resources are CNM Connect, computer and tutoring labs and a computer service desk. Prerequisites may be required to enroll in certain vocational programs that lead to an associates degree. Mandatory general education courses built into Associate of Applied Science degrees include math, human relations, writing and computer literacy. Each general education course is worth three credits. MyPortfolio is the portal that the college uses to publish course results and degree programs that they are pursuing. Eastern New Mexico University - Roswell Campus has a wide variety of two-year career-oriented programs under the headers of health, business & science and career & technical education. In the health programs, students can choose from several common two-year programs like nursing, child development, occupational therapy assistant and radiographic technology. Career and technical education focuses on more specific job skills like the two-year program in automotive technology. Business and science allows students to gain associate degrees in topics like accounting. New Mexico Junior College offers an associate of applied science, which focuses on more vocational programs. These are geared for students who are planning to enter the workforce after obtaining their associate degree. The associate in applied science covers several areas that are geared for getting students started in direct careers like nursing, welding, cosmetology and constructional technology. Many of these degrees will allows students to sit for licensing exams upon completion of their courses. These programs focus on a few general education courses, and then most of the schoolwork is put towards learning job-specific skills. At Santa Fe Community College, students can enroll in six academic schools for several areas of study, including trades, technology, sustainability and professional studies. The school has over 100 programs of study. For associate degrees, the associate in applied science and associate in applied arts cover the more traditional vocational school programs like allied health, criminal justice, nursing and paralegal studies. These are meant for students going on to work right after their two-year program. The programs vary in general education and core requirement (job-related) courses, though most tend to require anywhere from about 20-30 credit hours of general education and about 20 to around 40 credit hours of core requirements. At Luna Community College, students can choose from several schools from which to study. Job-related associate degrees are offered in the school of business, education, nursing, science, technology, engineering & math and allied health. There is also a general track that offers an associate of applied science degree in vocational/technical studies. This program allows students to complete their general education credits and then design their own program from certificate and elective requirements. Students typically complete a general education core and then are left to take around 28 hours of required courses that prepare them for life in the workforce. New Mexico State University - Dona Ana covers a wide range of programs of study. It’s noted for its more specialized associate degrees like aerospace technology, electric programs, environmental & energy programs, fire investigations and respiratory therapy. The college prides itself on offering small classes where students can receive more one-on-one attention. Students focus primarily on courses that will prepare them for the job, and in many degrees, will be prepared to sit for professional licensing exams. Students will be prepared both socially and technically to work in their chosen careers. At New Mexico State University - Alamogordo, students can gain vocational associate degrees the Professional Occupations, Technologies, & Fine Arts(PROTECH) division. These programs have a very strong general education base, with added courses in the chosen area of study. Students will be prepared with relevant skills to work in their chosen field, and many programs prepare students to sit for necessary licensing examinations. Students can pick associate degrees from an assortment of different disciplines, like business office technology, graphic design and information technology. At the University of New Mexico - Valencia County Campus, students can obtain two types of associate degrees related to vocational studies: an associate of science and an associate of applied science. Within the associate of science degree, students focus on areas like emergency medical services and nursing. The associate of applied science allows students to study technology-related disciplines, like computer-aided drafting, construction technology and information technology. After completing these programs, students will be prepared for entry into the workforce and will have the skills they need to succeed. The primary benefit of enrolling in one of New Mexico State University’s vocational associate of applied science programs is the specialized education the permits immediate entry into a new career. Students in one of these programs will be learning valuable skills that are in high demand, helping to assure that students will have successful careers ahead of them. Financial aid advisors are ready to help all students develop a financial plan for their college careers, including the possible incorporation of scholarships and federal aid. Included in NMSU’s 180 degree programs are graduate degrees as well, for any student who wishes to continue their education. Vocational and trade students in New Mexico can get their educations through both secondary and post-secondary study. Comprehensive high schools, Early College high schools, charter schools and workforce readiness programs all deliver career and technical education (CTE) to high school students across New Mexico. New Mexico’s secondary students can get CTE through the state’s community college system, but they aren’t limited to two-year schools; vocational and trade education is also available at New Mexico’s four-year institutions that offer associate’s degrees. Students looking for vocational and trade schools in New Mexico can use this search tool to help them find a school that fits their needs. New Mexico schools have face-to-face, online and distance learning opportunities for vocational and trade students. Unlike many states, New Mexico splits its CTE funding equally between secondary and post-secondary programs. 92.7 percent of secondary students enrolled in vocational programs in 2014 graduated. In 2013, New Mexico began deliberately aligning education and training programs with available employment in the state. Vocational and trade students in New Mexico can earn associate degrees, one-year certificates and less-than-one-year certificates at many of the state’s educational institutions. Students can earn associate degrees in vocational and trade programs at community colleges and some four-year colleges in the state. Sub-associate credentials are also available through various types of high schools, community colleges and workforce readiness programs. The table below shows which types of credentials students earn from vocational and trade schools in New Mexico and how that compares with credentials earned nationally. Health care and social assistance, educational services and accommodation and food services are expected to see the most growth – 24.6 percent, 23.8 percent and 19.7 percent, respectively – and supply the most new jobs between 2012 and 2022. In 2013, 1 in 6 New Mexico jobs were in the health care sector, making it the state’s top employing industry, so perhaps it’s no surprise that New Mexico’s vocational and trade students flock to health sciences programs. Furthermore, it’s the state’s fastest growing industry. New Mexico’s industry subsectors that are expecting both the largest and fastest employment growth are educational services and ambulatory health care services. The table below lists specific occupations with the most annual job openings for people with some college and for people with associate’s degrees. Albuquerque is New Mexico’s most-populous city, with two of every five New Mexico citizens living there, so many of the occupational opportunities for the state as a whole apply to Albuquerque. Albuquerque’s employment growth rate, however, is higher than the New Mexico’s, at 14.9 percent. Health care and social assistance, education services and food and accommodation services should see the fastest growth and the most employment opportunities for those living in Albuquerque. Albuquerque’s students can prepare for jobs in these industries through programs of study at vocational and trade schools in Albuquerque. The city has one community college and three private, for-profit technical and career schools. Central New Mexico Community College offers associate degrees, less-than-one-year, one-year and less-than-four-year non-associate credentials in vocational and trade areas. Carrington College focuses on health science programs. Its students can earn associate’s degrees and one-year certificates. Brown Mackie College and Brookline College are both four-year institutions that offer one-year certificates and associate degrees in a variety of vocational and trade programs of study. Provides and overview of New Mexico’s career and technical education programs, including its mission, areas of study and enrolment data. An association for the support, promotion and development of CTE in New Mexico. Includes CTE news, legislation and informational articles. Assistance for New Mexico residents to find jobs, create resumes, learn about the labor market and attend job fairs. Provides information and resources for job seekers as well as labor market and employment data, including regional and state employment projections. Government webpage that provides information on New Mexico’s universities and community colleges. Provides information and resources regarding college and career readiness programs throughout the state, including information on High Schools That Work, dual credit and CTE funding.